You never know when the urge to grow a particular plant is going to strike. 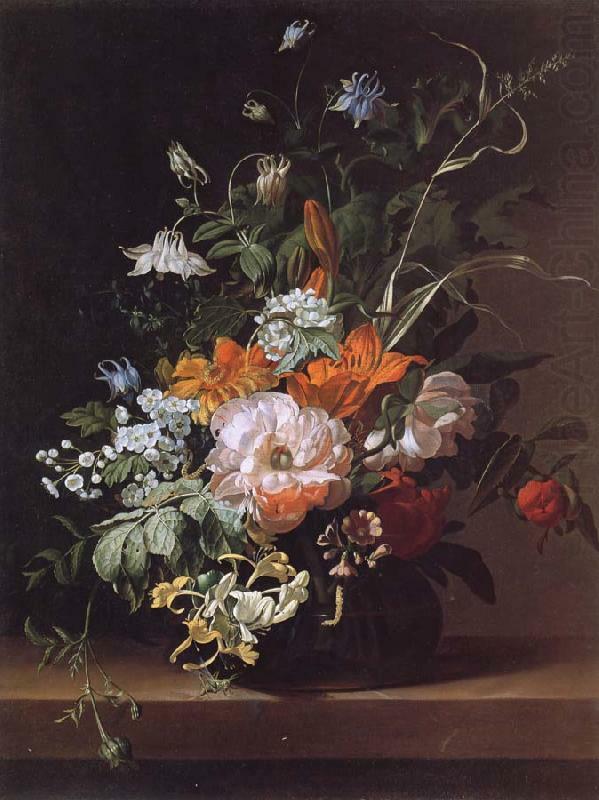 Hanging in London’s National Gallery is a small painting labeled simply “Flowers in a Vase: Rachel Ruysch: about 1685”. Towering above the lilies, roses and peonies in the painting is a group of exquisite Aquilegias. The flowers are so delicate and elegant that you immediately want to grow them. The appearance of the flower in this and earlier paintings is a reflection of how long gardeners have been growing Aquilegias. Ease of culture and of propagation combined with long-lasting flowers have made it popular with gardeners for centuries. The genus is widespread throughout the northern hemisphere from north America, across Europe into the Himalayas and out as for as Japan. Plants are variable in height from 10cm to over 1m and the flowers encompass the whole colour spectrum. The most striking feature of the aquilegia flower is the way that each of its five petals has developed into a spur that contains nectar. The size and shape of the spurs varies greatly, giving a wide range of flower shapes. A. longissima, from the southern states of the USA, has spurs that are up to 12cm long with the result that the flowers look like a bright-yellow comet shooting through garden. The cut-flower industry has used it to develop lots of long-spurred hybrids. These look impressive in bouquets but tend to be short-lived and do not stand up well to the the rigours of life in the garden. As its name suggests, A canadensis, grows further north in the continent. It has soft yellow and red flowers and was introduced to Britain at the end of the 17th century by plant hunter John Tradescant. The most widely-grown Asian species is A. viridiflora, which is often marketed as A. ‘Chocolate Soldier’. The flowers have chocolate-coloured petals that are surrounded by olive-green sepals. What really sets it apart is the spicy perfume the flowers pump out on warm days. It is a delicate plant that is easily swamped in the garden so grow it in a raised bed or in large terracotta pans. Enjoying similar conditions is A. flabellata, a low-growing compact plant, about 20cm tall, with dainty powder-blue and white flowers. Although now rare in the wild A. flabellata it is native to central Japan. A particularly beautiful form (and my own favourite aquilegia) is A. flabellata var. pumila f. alba. It has a mound of glaucous foliage and a smothering of small white flowers. It used to be called A. flabellata ‘Nana Alba’ and still goes by that name in most nurseries. In Europe the azure blue flowers of A alpina light up alpine meadows. The Alps are also home to the dark, almost black, flowers of A. atrata. The most widespread european species is A. vulgaris and the ease with which it cross pollinates has led to hundreds of cultivars and hybrids. One of the oldest hybrids, named last century for Charles Darwin’s granddaughter, A. vulgaris var stellata ‘Norah Barlow’ has been around since the 17th century. The flowers are a ball of tightly-packed pink and white petals that have a green tinge. Recently several seed strains have been produced that have the same flower shape. Some hybrids, such as A. ‘Flamboyant’ have such a density of petals that they create a pom pom shape. The ease with which the genus cross pollinates has produced an immense variety of flower colour and shape but this has come at the cost of stability. Although there are some seed strains that produce offspring that are roughly similar to their parents most progeny will be different. Named cultivars can vary widely, so don’t expect uniformity in aquilegias. Grow them not for their regularity but for their wild diversity. Look again at Rachel Ruysch’s painting. Her flowers are white, tinged with green or washed with blue: each one different; each one as beautiful as the next. The north American species such as A. canadensis, A. chrysantha, A coerulea and A. longissima grow best in deep, rich soil that does not dry out. The alpine forms, A. alpina and A. atrata prefer a more free-draining soil. All do best in dappled shade. 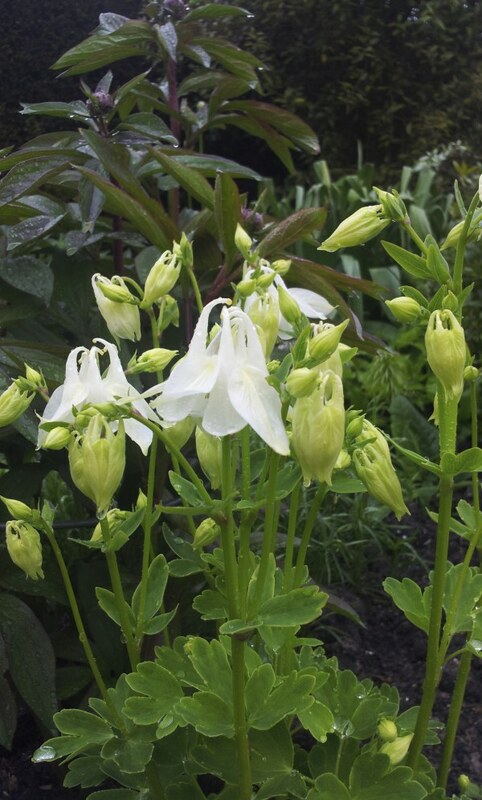 However, Aquilegia are very tough plants that adapt quickly to their growing conditions and will even grow in poor soil in full sun. Some of the tall forms of Aquilegia can blow over in even gentle winds, so may need to be staked. Put the stakes in early in the season so that the foliage has a chance to cover them. 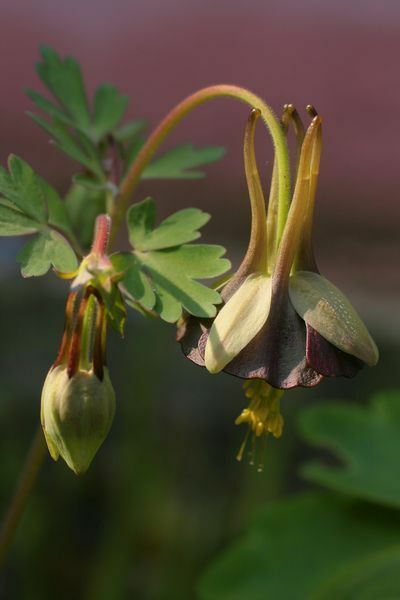 Aquilegia are prolific self-seeders and if you are growing several varieties in the garden the progeny may not be the colour or size that you want. To avoid unwanted guests cut down the flower stems before they set seed. Be wary of named cultivars. These will probably be seed-raised and may not be what you are expecting. Gertrude Jekyll wrote enthusiastically about a white-flowered form with grey-green foliage and flower stems about 90cm tall. You can find it in nurseries as A. vulgaris ‘Nivea’ but plants for sale vary in height and foliage colour. This doesn’t matter if what attracts you are the white flowers, but if you were hoping for tall spires and get a 30cm high mound, you may be disappointed.